.) This deal is NOT TRANSFERABLE and is only good for that one hour. (Nice incentive to come to the meeting and pay your dues, right?) THANK YOU AiH FOR THIS DEAL!!! 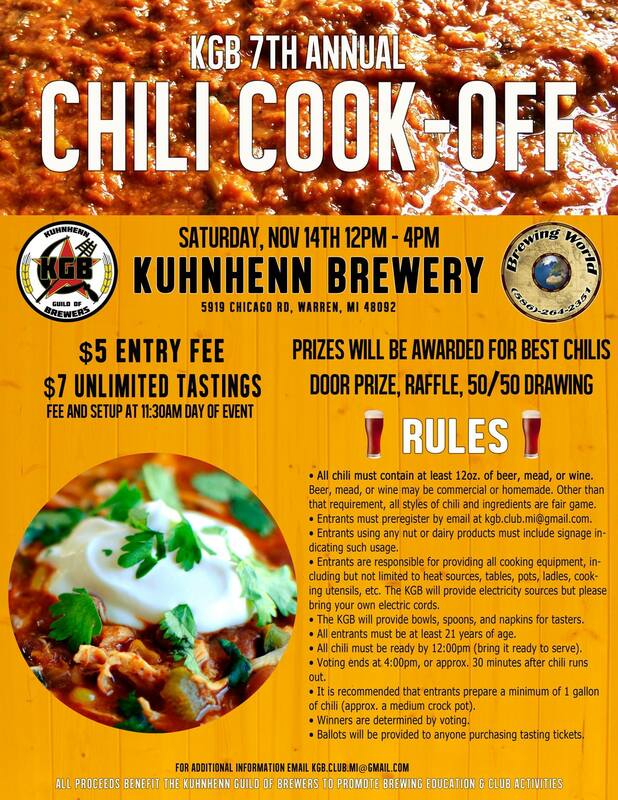 Finally, ‎Steve Smalenberg from the KGB has invited us to join them for their annual chili cook off at Kuhnhenn Brewing Co. on 11/14. We can come to compete or just eat. See graphic for details (below). If you have questions, please contact them using the email in the graphic. Competitors must preregister this year, so please email if you would like to enter the Chili Cook-off. Jennifer and I will be attending the MBG Detroit Fall Beer Festival both days. Let me know if you would like to meet up. Cheers!